I’ve been holding off writing Carol’s story for a while now. Mostly, because the more I dig into it, the more bizarre and complicated it seems to get. Even to herself, it seems. While only a few in Winnipeg even know who Carol is — minus a large number of frustrated cops — if you’re a north-south commuter, there’s a good chance Carol has touched your life in a small way at some point. I decided today that I’m just going to tell Carol’s tale the way it has unfolded for me in the last 12 weeks. April 28, 2010. 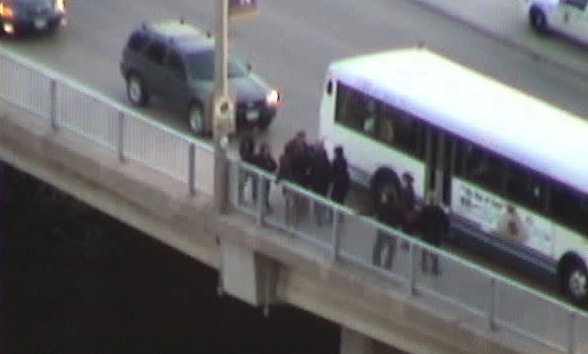 A woman threatening to hurl herself off the Osborne Street bridge is rescued by passengers on a city bus and others just walking by. Rush-hour traffic is snarled for about an hour as a large contingent of police and other rescue crews rush to the area. The story made national headlines and included this comment from the Winnipeg Police Service. [Police] confirmed the span is a common place for people in distress, and officers have been called there a number of times in recent weeks. As many as four police cruisers, the river rescue unit and a number of paramedics are called to the scene. 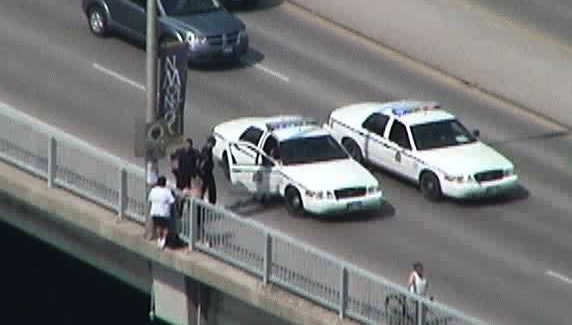 After about 40 minutes, the woman — the same one as in the April incident — is pulled back over the railing to safety. On each of these two occasions, police charged the woman with mischief and ordered her held in custody at the Remand Centre. After the first time, it sure surprised me. By the second, I knew why. But, I confess I’m still scratching my head. This is the story of Carol, a clearly troubled 40-something woman who hails from Ste. Rose du Lac, but has effectively been living in Winnipeg for the last two decades. I’m not using her last name because I personally believe Carol suffers from a mental illness. And, really, who she is is incidental to what she does, and what it may say about the justice system in Manitoba. But the problem is that I can’t tell if her story is one of personal tragedy and frustration — one of many such stories of urban life existing under our noses — or, as the reporter in me suspects, Carol is an attention-seeking con artist looking to scrape any advantage to get herself out of the jackpot. My research began when a colleague tasked with filing a national story on the April bridge attempted suicide and rescue scenario asked me to find out Carol’s name. Police had charged her, but didn’t ID her and she wanted to know why. So I did. But I took it a step further, because now I was curious. So was Judge Kelly Moar when Carol, aged 43, appeared before him a few days after she was wrestled from the deck of the bridge and into a squad car by officers. “This is a mischief charge?,” he asks. “Yes,” the Crown responds bluntly. Yes. “And she was detained on that? Must be something behind it,” Moar says. Carol elects to dispose of her charge that day instead of just trying to get bail. The Crown reads out the facts of what happened, but not without a little preamble. Between Feb. 27 and Apr. 28, Carol placed numerous calls to 911 where she threatened suicide. The WPS calculates that in that time, Carol was responsible for using up 112 [real] hours of police time to check up on her well-being. The facts of what happened that day were as they were in the story: She climbed over the rail of the west side of the bridge and was pulled back over, “yelling and swearing” and arrested for public mischief. But when her defence lawyer begins to speak, things start to make sense. According to the lawyer, Carol’s husband suffers from Alzheimer’s and was recently admitted to a nursing home. “She’s lost an apartment she was living in, lost a lot of the furniture … it’s a situation where the Public Trustee is getting involved to look after her because she suffers a lot of stress. Her husband’s been given approximately 1-2 years to live. She’s been very stressful with him,” the lawyer tells Moar. Since a prior domestic-related conviction in January, Carol’s been getting frequent counselling. The lawyer proposes probation and a fine, not further jail time. Carol is granted an opportunity to speak. I urge you to read closely what she says, and remember it. “I’m just going through a lot of stress with my husband so, I’ve been looking after him for the last 8-9 years with his Alzheimer’s,” she tells the judge in the high-pitched squeal of a voice I’ve come to know well. “So I put him away, we signed the papers in November, put him into a nursing home and I’m the only one whose been looking after him, so it’s pretty stressful. Where’s your family, Moar asks her. Why all the calls to police? Moar: You’ve been giving, giving, giving and not taking care of yourself. “I understand, sir,” Carol says, adding she’s recently seen a doctor who suspects she may have bowel cancer. He’s aware of everything that’s been going on with her, she says. Moar, who I add is not a softy judge, agrees to release her on probation and a time-served sentence of 3 days. Carol’s ordered to keep the peace, report to probations no later than a week from that day and attend, complete any counselling as directed. She’s also ordered to live at home on Langside Street. Moar stops and wonders if Carol has a problem with booze. On the advice of her lawyer, he doesn’t add an abstain clause because, as the lawyer and Carol both tell him – she does not have a problem with alcohol. She’s sent packing from jail and back on the street. Many in the CBC newsroom agreed, but there was an obvious concern: Would publicizing her story drive her to attempt suicide again? We decided it was best to keep digging – to approach Carol at the home on Langside where she told the court she’d be living. My colleague, Gosia Sawicka, and a camera guy went by the place, just to see if she’d talk. Outside the home is a squad car, with two bored-looking PO’s inside. Sawicka asks them if she’d be interfering with anything by knocking on the door. “No,” the one says. But he asks her: Who are looking for, anyways? “So are we,” the cop says. I remembered the next day that during the hearing, the Crown related to Moar that Carol had been in custody for a breach of a domestic-violence restraining order in January of this year. I sleuth out the date and ask for a taped transcript of the hearing, just wanting to hear what that was all about. It seemed odd to me that if her husband was admitted to a nursing home in November, that Carol would be charged with breaching the order. It seemed odd in general, period, that the man she said she so cared for on the public record a few days prior had a restraining order against her. At this time, I didn’t know anything about the guy, except that his name was Fred. I didn’t yet know his age. I also requested to view a copy of the order Fred had obtained against her through the court clerks. The tape was ready first. The facts of the breach were relatively straightforward. Fowler and Fred in a relationship for about 13 years. They are clearly not married. On June 28, 2009, Fred goes to a Furby Street house where Carol, he and a pal begin drinking. An argument ensues and Carol calls 911. Police arrive, do a CPIC check and discover she’s in breach of the protection order. The order had been made and granted five years prior, in October 2004. It was still in effect. Police don’t detain her, instead releasing her on conditions to stay away from him and not drink any booze. But on January 14, 2010, the Crown says she and Fred are in a home on Stradbrook. They’re drinking and a fight breaks out. The ferocity of the fight causes neighbours to call 911. Hold on a second, I’m thinking. Hasn’t Fred been in a nursing home since November when she had him committed because of his illness? Anyhow, police come to the house, check into it and discover Carol’s breaching the recog from June and the restraining order. Prosecutors note she has no substantive convictions since 2004. Crown wants her to have the 14 days in custody she’s spent noted on her record, and put her on 2 years of supervised probation. Conditions: No contact with Fred, get an addictions assessment etc. The restraining order was obtained a long time ago when Carol was in Calgary visiting friends and family. According to the lawyer, Fred’s son sought the order because he frowned on the relationship they had. “Ms. Fowler tells me that [Fred] has been suffering from Alzheimer’s these last six years, that he was in a very suggestible state of mind — he was easily manoeuvred into doing things,” the lawyer says regarding how the order came to exist. “[He] was convinced by his son that this protection order was necessary and back in 2004, when those [orders] were issued, there was no expiry date,” he says. From that, Carol was suffering from a “slight degree of confusion” because an unnamed officer once told her the order had expired. “She tells me she was under a great deal of stress — the protected individual was having a difficult time, apparently, and had been in contact with her. She invited him over to her place so she could look after him a bit. Carol disputes there was ever an argument with Fred, believing that when the dishes crashed down she may have screamed for help and that it could have been construed as an argument. Fred is terminally ill, the lawyer says. “I am guilty for what happened, that’s all I have to say,” she tells Judge Judith Elliott. “I don’t want that anymore — I just want to get on with my life and I’m trying my best to stay out of trouble and everything else. Questions are raised about alcohol, whether she and Fred are heavy drinkers. “I don’t think so,” Carol says. “It’s because of the Alzheimer’s. The doctor gave him about a year, year and a half to live — they took him off his medication, now there’s nothing they can do for him anymore. “And because I loved him so much, I looked after him what with the place and the pressures and everything else — I drank. If I have to, I will go and get myself into help,” Carol says. The lawyer speaks again: “Ms. Fowler has advised she does have chronic alcoholism issues,” he says. If a no-drinking clause is added to her probation order, she’ll just be set up to breach it. “I’ll do whatever [I] have to do and I’ll try as best as I can because I need to get over this. I need to start my life and I’m trying the best that I can right now. I have been good for the last few years. I’ve been back to work, I’ve done upkeep on my computers, everything,” she says. Elliott notes the 14 days time in she’s served and gives her the probation. Conditions: Keep peace, come to court as directed, report within seven days. The hearing ends and Carol’s now back on the street. The alcohol problem remains uncertain: is she a drunk or not? If the guy’s in a nursing home and sick as a dog, then how’s he out drinking in West Broadway? Is Fred her husband? Or a common-law, or a boyfriend? The Alzheimer’s story is starting to sound like a ruse. How old is Fred? Turns out Fred is, at the time of the January breach, a 75-year-old man. A senior citizen who, under his own power goes out drinking with a woman half his age in rough parts of the city. At least, according to the affidavit filed under his name to get the restraining order. In that document, a number of startling things are revealed, and basically confirm Carol’s sob story of the sick husband she’s been peddling to judges is a carefully-crafted lie to gain sympathy. At least, that’s what my spidey senses are telling me. When the was released, he admits to “foolishly” taking her back based on her pleas she had nowhere to go and would terminate the abusive behaviour. Carol once took his credit card info and flew to Calgary without his consent [see defence lawyer’s comments above] … as a result, she came to his son’s home (he had expressed his anger at her actions) in South Osborne and keyed his car, he believes. On October 3, 2004, I was asked by Winnipeg Police to accompany them to the Osborne Street Bridge near the Legislature Building in Winnipeg where I was informed that Carol had placed herself on the river side of the railing and was threatening to jump into the water. “I did attend with the Police and after some discussion and negotiation, she gave up two knives that she was holding and permitted the police to lift her over the railing to safety. “I believe this was done in an attempt to gain my sympathy or to get back into my good graces as she had done the very same thing four years ago which resulted in my taking her into my home. The document goes on to describe a bizarre escape from the St. Boniface Hospital right after that, but that’s neither here nor there. The protection order is granted. But there’s a question: The document is prepared by a lawyer, which is unusual for these orders, which are more often than not handwritten by the person seeking one. Could it be that Fred does in fact a helpless man with Alzheimer’s and that his son is now pulling the strings on his behalf? Without actually speaking to them, it’s impossible to know. But then, if half of this stuff happened to my dad because of a total stranger to our family, I’d do the same thing, most likely. Bearing all this in mind, I drop the story for the time being. I don’t know what to make of it. But on the afternoon of June 23, Carol goes public again and hops over the railing. It’s the exact same spot as the last time … Most likely the spot where she started doing this in 2000. After pulling her over to safety, police charge her with everything they can get away with, including littering. Crown facts: She hops the railing at 3:45 p.m. and police rush to the scene and close half the bridge for an hour. Two squad cars and eight other emergency vehicles are also called there. As she stands on the wrong side of the railing, Carol sips a king can of Molson’s Dry and appears to talk with a passerby at length. The Crown notes, unlike the April hearing, that this is the 9th time in 2010 that she’s threatened to jump and hopped the railing. The Crown’s wrong. She’s actually done it an even 10 times. The Crown reads in a long list of dates that the incidents happened — Feb. 27, March. 12, March. 20, twice on March 29, April 16, 20, 21 and then on the 28th. This time, prosecutors think a 45-day stint in jail will teach her a lesson. “This behaviour can’t continue,” the lawyer says. But more complications to the above arise when Carol’s lawyer speaks up on her behalf after she again pleads out to the mischief charge. Fred, her “common-law” is a ward of the public trustee. Judith Elliott is the judge again. She last sentenced Carol in January. “The situation has deteriorated,” the lawyer tells Elliott. “It was in response to the news that he had passed away that she reacted extremely emotionally” and “was thinking very seriously about casting herself off the Osborne Street Bridge to the tender mercies of the Assiniboine River,” the lawyer says (A+ to him for language use). Carol is not an individual that needs to be locked up, he says. She’s crying out for help. “She needs help more than anything. She needs support and encouragement. And in spite of being on probation, the probation officer … has not been of much assistance to her,” he says. Carol again speaks up, but is far less verbose than she has been in the past. The probation officer she drew is at least partly to blame for her predicament, this time. “She doesn’t want to listen (the PO). She judged me the first time I seen her. Gave me a hard time. Carol now sighs and tears up. She continues: “All I wanted was [inaudible] that everything would be all right and I haven’t got that from anybody,” she squeaks. Elliott recommends Fowler head straight to a clinic or doctor to get a referral to a psychiatrist. She refuses the Crown’s request for the six-week jail term, instead just punting her from the Remand for the third time in half a year to the ‘tender mercies’ of provincial probations. “No more drinking on the bridge,” Elliott says. “Thanks a lot,” Carol says. The Crown stayed the littering charge. Either by now, you’re thoroughly bored with Carol (and me), angered at the system, confused, or a mix of these things. Carol’s story is informative on a couple of levels, I think. If you accept that her story is one of personal tragedy, you’d probably wonder why the system can’t seem to do anything for her. If you don’t believe her story … stories … then you’re probably frustrated at how much of the city’s emergency resources have been used to deal with an attention-seeking woman who probably has no real intention of jumping. One thing’s for sure, I feel. Carol’s story is another example of how the justice system, arguably the largest intelligence-gathering enterprise we have, seems to fail to appropriately share that information between departments. Judges aren’t getting all the info they need to make decisions from the bench. But at the very least, the next time you’re stopped from heading across the Osborne Street bridge during rush hour, you’d now have at least one idea as to why, and who. Carol’s story, after all, is a part of the essential fabric of our city.